Elvis' Gold Records Volume 5 is the final album in the Golden/Gold Records series by Elvis Presley (which began in 1958), issued posthumously on RCA Records in stereo, AFL1 4941, in March 1984. It is a compilation of hit singles released between 1968 and 1977. It is the only one of the series to miss the Billboard album chart, "bubbling under" at #207 for two weeks. However, it was certified Gold on 7/15/1999 by the RIAA. Gold Records Volume 5 comprises nine Top 40 A-sides along with one b-side, "For the Heart" from 1976. Released more than sixteen years since the previous installment in the series, it covers a span of almost ten years. 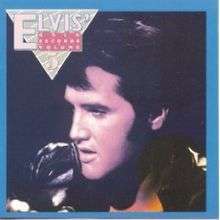 The first half of the album focused on Elvis' late 1960s comeback-era recordings: "If I Can Dream" was taken from his comeback special, three singles from the American studios sessions "Suspicious Minds", "Kentucky Rain", and "In The Ghetto", and "Clean Up Your Own Backyard" was a soundtrack recording from The Trouble with Girls. The second half of the records focused on Elvis' late period singles including "Burning Love" and "Moody Blue". Interestingly, RCA did not base the selection solely on commercial factors, as they omitted two top ten hit singles from this time period, "Don't Cry Daddy" from 1969 and "The Wonder of You" from 1970. The July 15, 1997, reissue added six bonus tracks taken from a three-year span from 1967 to 1970, including three additional Top 40 singles. The sequence was largely left intact, though "If I Can Dream" was moved to the end of the disc. RCA's selection of bonus tracks is somewhat surprising because it focuses on Elvis' pre-comeback recordings rather than 1970s hits; "Always On My Mind", "Promised Land", "Steamroller Blues", "Separate Ways", "Hurt", "T-R-O-U-B-L-E", "I Really Don't Want To Know", and "Until It's Time for You to Go" were among Elvis' top forty hits during the decade. Only "Memories" which was featured on Elvis' comeback special and "You Don't Have To Say You Love Me", a top twenty single in 1970 are consistent with the selection from the original album. Three of the bonus tracks are from soundtrack recordings, "Big Boss Man" and "Guitar Man" were originally released as bonus songs from the Clambake album (as well as 2 late 1960s hit singles) and "Edge of Reality" is from Live a Little, Love a Little (it was also the B-side to "If I Can Dream"). The remaining track, "U.S. Male" was a 1968 single. Originally recorded at RCA Studio B in Nashville, Tennessee, RCA Studio C in Hollywood, Western Recorders in Burbank, California, Stax Studio and in The Jungle Room in Memphis, Tennessee. Original recordings produced by Felton Jarvis, Chips Moman, Bones Howe and Billy Strange.